The municipality of Gümüşhacıköy (22,941 inhabitants in 2016, 14,450 in the town of Gümüşhacıköy; 65,400 ha) is located 80 km north-west of Amasya. 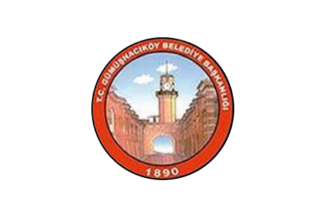 The flag of Gümüşhacıköy (photo) is white with the municipality's emblem. "Belediye Başkanlığı" means "Municipality Presidency". The emblem features the bazaar, its entrance gate and the clock tower (photo). The bazaar is located in the center of the town, south of the Köprülü mosque. It was built by Köprülü Mehmed Pasha in 1660. The clock tower was added via Ali Rıza Bey, the son of Yanyalı Mustafa Pasha. Forming a long rectangle, the bazaar consists of vault-covered shops. It is ornamented via high sharp belts consisting all sides of fronts looking at the courtyard. The deep molding wrapping along the props in the upper side gives special view also motıon to the inner part.